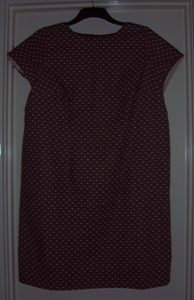 On 4th October I posted a blog headed “Back to Basics” where I discussed making a new toile shift dress. Unfortunately the fashion fabric dress was delayed but I did manage to finish it a couple of weeks ago. 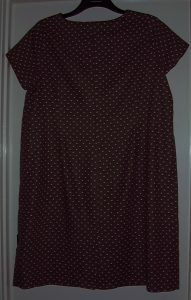 I used a linen-look Chocolate Brown and Cream spot fabric bought a couple of years ago from Fabricland. I had intended to make a different pattern and hence had more than enough fabric for this incarnation. Infact, you may recognise the fabric as I used some of the surplus as the contrast when making the Maggie Bag. Having already made a toile I was confident in cutting and stitching the dress with the minimum of fittings and alterations. I had already laundered the fabric to minimise the risk of shrinkage so if the dress does get smaller on me it will be due to personal expansion not fabric shrinkage! The dress took approximately 4 hours to stitch. I set the lapped zip with 4 rows of machining rather than spending time making a hand-picked insertion. I was also fortunate that the pattern match is pretty fair considering that I was not paying too much attention to the location of the spots. The sleeves are lined with calico. The neckline and sleeve hems are top-stitched with a twin needle. There is a back hem vent and the hem itself has been hand stitched. 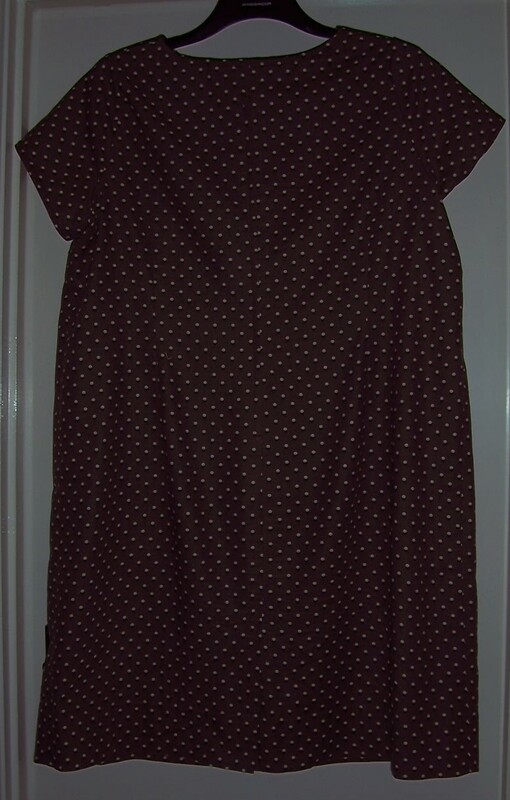 I am especially pleased with this dress as due to the “qualities” of this fabric it has come out a little larger than the original toile and is therefore very comfortable to wear. The fabric, although it looks like Linen, does not crease and even after a day of standing and sitting is devoid of creases across the front.